Cycle Republic recently released The British Cyclists’ Survey, with some interesting findings. According to the survey of 500 cyclists across the UK, they feel “generally unsafe” whilst cycling. So, why do we see so many people riding around without helmets? I learned it’s not illegal to not wear a helmet – something else that surprised me! I’m clearly not very clued up on this cycling stuff (other than my recent post about bike theft, where I talk about my beloved bike being stolen from me), but I do know that it’s very important to wear a helmet whilst on any moving vehicle such as a bike, scooter or skateboard. I see so many kids riding around with no helmets on, it just seems to be the norm? When I drive Fin to school, most days I see kids, probably entering their teens, not wearing helmets, and just flying down the roads, up paths, down paths, out in front of cars. 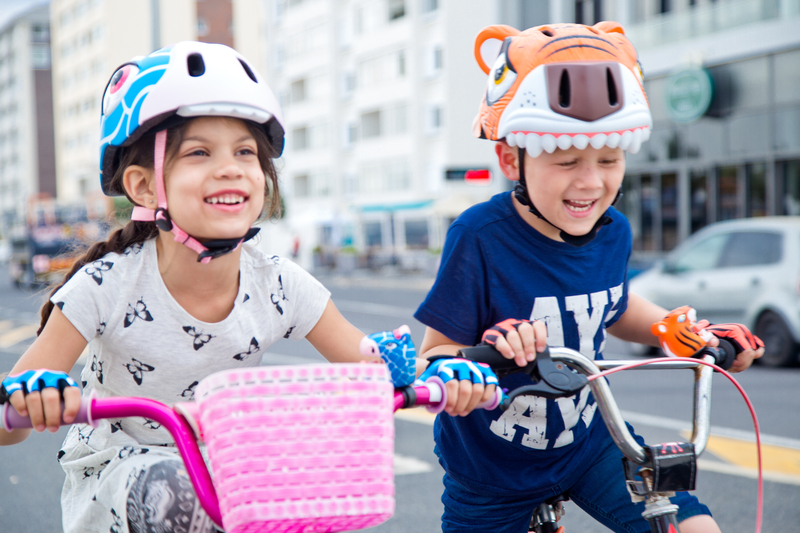 Whether their parents made their kids wear a helmet when they left the house, I don’t know, but a few certainly don’t wear them on the way to school. Perhaps it should be illegal, and more kids will wear them? There are plenty of reasons to adorn the head of your loved one with a helmet, but the main one is to lessen the chance of suffering a serious brain injury. That’s quite enough for me to try to remember to bring a helmet every time my kids and I go out with a scooter or bike. I remember when the helmet ‘trend’ hit… I must have been about 7 or 8? My mum would cycle my brother and I to school most days, and one day she told us we must wear a helmet. I was distraught… she made me put a bright green SKID LID (remember those!) on, which made me look oh so very cool along with my bright yellow ghostbusters rain cape. Jeez, I must have looked a fright. I remember back then that there were a lot of awareness videos out, including ones at school. I would hope that schools still teach cycle safety – I haven’t got to that age child yet to know (tell me in the comments if you know). Every year, about 300,000 kids go to the emergency department because of bike injuries, and at least 10,000 kids have injuries that require a few days in the hospital. Some of these injuries are so serious that children die, usually from head injuries. I, for one, will be making sure Fin (and Indi, when she’s old enough to ride a bike) wears a helmet all the time now. Thank you to Cycle Republic for reminding me to put my child’s safety first. Here’s the full Cycle Republic survey. Thanks for sharing this. My brother and I somehow survived biking in the US and in Europe without helmets. We were daredevils and had some very close calls. I definitely wear a helmet when I bike now, both as a role-model for our daughter, but also because it just makes sense.